Norway´s National Transport PlanBridging People. 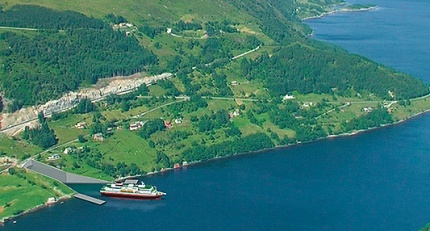 The Norwegian Government published some weeks ago the National Transport Plan 2014-2023. The main goal by creating such a plan is to provide an effective, accessible, safe and environmentally friendly transport system that meets society’s need for transport and promotes regional development. Link to the full English version of the plan here. Computer image of the proposed Stad ship tunnel. The investment is huge, especially on roads and railways. The main projects are “Ferrry-free E39”- linking Western Norway through an upgraded and ferry-free E39, “Stad ship tunnel”- the world´s first ship tunnel with the aim of reducing the risk of accidents and improve navigation along the coast, “Intercity”- an enormous railway project south-east in Norway, and the “Follo-line”- a high speed railway line between Oslo and Ski. 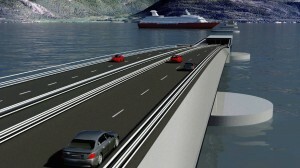 Floating bridge: One of the possible solutions for a ferry-free E39. The Government plans for an increase of about EUR 20.9 billion during the ten-year period from what would be a continuation of the 2013 budget level. This constitutes a total amount of EUR 63,5 billion, with an increase of 50% on railways and roads! So what does this means for engineers with experience in the infrastructure sector and knowledge of Norwegian? We think there can be some opportunities in the many projects that will be launched within the next months! Quiero trabajar en Noruega ¿Como podéis ayudarme? Sobre “Bridging People” Y “El proyecto Frisk Bris Consulting, recruiting, and coaching”. Copyright © 2013 Frisk Bris S.L Recruitment & coaching . All Rights Reserved. Designed by Frisk Bris S.L.